Music at a concert is different to music played at home, or in the car, because the high acoustic energy that surrounds you means you don't just hear the sounds, you feel them. There have been attempts in the past to marry sound with vibrations -- subwoofer chairs and vibrating vests, for example -- so that games or movies feel more realistic, but Woojer, which successfully raised $143,000 on Kickstarter, takes a subtler approach. The matchbox sized subwoofer is worn on the body and connects between any audio source (your phone or a tablet, say) and headphones. The audio input -- be it a music track, a game or film -- is transformed into a tactile vibration, which you can feel throughout your body. 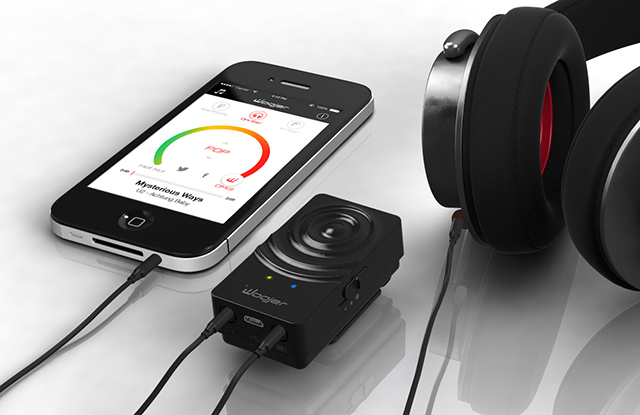 The device charges via microUSB and takes around three hours to charge fully. It can be worn in a choice of ways. There's a belt clip, a magnetic clip (so you can attach it to a shirt) and an optional sport strap. You can decide which to use, depending on what you're wearing. Obviously, the device needs to press against your body so you can feel the vibrations. It's best placed in the center of your chest or against the base of your spine, but you can also try it against your hipbone or collarbone. You connect your audio device to the input (a male-to-male audio cable is supplied), and headphones to the output, turn Woojer on and start some audio playing. The device itself has an on/off switch on one side, and another switch to adjust the vibration levels. You're advised to disable any base boost or DSP (Digital Signal Processing) on your audio device when you first use Woojer. The vibrations you feel are subtle, even when it's on the full vibration level, which is good because you don't want to feel like you're being thumped repeatedly in the chest or lower back when listening to music. It's designed to enhance the audio experience, not distract from it. It can feel a bit uncomfortable at first as it's a little heavy (it's only 73 grams, but you do notice it when it's against your chest), but like anything, you soon get used to it. Does it add anything to the audio experience? Absolutely, although not in every case, obviously. If you enjoy listening to light flute music, you'll get nothing out of Woojer, but if you love music with a heavy bass, then it definitely enhances it. I enjoy audio-only games like Papa Sangre II, and Audio Defence: Zombie Arena, and in playing those I got to really appreciate what Woojer brings to the party. Those games are fairly scary as they are, but being able to feel the audio, instead of just hearing it, takes the terror factor up several notches. You get the same benefit watching action movies and horror films, and of course Woojer really shines in FPS games. There's a free bass-enhancing app for iOS (Android coming soon) which offers eight settings designed for different genres of music (classical, electronic, dance, pop, rock, R&B, hip-hop, and flat), and you can use a slider to adjust the setting from anywhere between Hell No! and OMG!. You can also specify the type of headphone you have -- EarBuds, On-Ear or In-Ear. This all makes a big difference to the experience. If you really want to feel your sound, there's an Extreme Kit available which comes with two Woojers, so you get double the impact. It's perhaps a little pricey at $99.00 for the one unit, and $179.00 if you opt for the two-pack, but it's a very high quality device and if you like your music and it's something that appeals to you, then you definitely won't be disappointed. Woojer is available in a choice of colors -- Black, White, Red, and Green -- and can be purchased from www.woojer.com.